Tis the season for car commercials. There is a Lexus ad that seems to come on every commercial break, and since we’ve been iced in and watching a lot of TV, I’ve seen it a few thousand times. A gorgeous brunette works at a sewing machine, making giant bows for cars. A decent looking man drives one of said cars. I don’t know what men think about when they see these ads, but I caught myself having a thought that gave me pause. After wondering if people really buy each other cars for Christmas, I found myself thinking that if I were thinner and more chic, I could have a fancy car, but as long as I was overweight, I would never so much as see the inside of the dealership. Funnily, I realized I have that conversation in my head about a lot of things. From jewelry and underwear, to cars–apparently–I’ve got it in my head that until I am 5’10”, and wear a size 4, I will never have that bracelet, that bra, or that Lexus. The bad news is that while I quit growing vertically in 1992, and never topped 5’3″, my width fluctuates almost seasonally. I’m fattest in the summer, in case you wondered. I don’t like to move around in the heat. Anyway, my point is that I really thought I was immune to all of that! I really thought I had myself together when it came to body image (because I am totally cute), and it wasn’t until I heard this back-of-my-head voice, matter-of-factly (and it was! it was so blase. “You are overweight, and you will never have X, Y, Z until you look better.” Not shaming, not lecturing, just, “These are the facts, ma’am.”) telling me I wasn’t good enough, that I realized how insidious the issue is. I was thinking all that and the trick is that I HAVE EXCELLENT SELF ESTEEM. What about the women and girls who don’t? Later in the day, I came across this video of a lecture by Jean Kilbourne, in which she discusses how the media reduces women to Things in advertising, and how that affects so much more than just self image. It’s really worth the five minute watch. Meanwhile, meanwhile, I would not trade all the luxury items in the world for how it feels to sit on my sofa with Thor in my lap, and B snoring beside me, watching the Eagles destroy the Lions in the middle of a blizzard. Maybe nothing tastes as good as skinny feels, but nothing feels as good as my life–and my life comes with some cushion. Working to help my mom get some things in order, I’ve come across some old pictures. 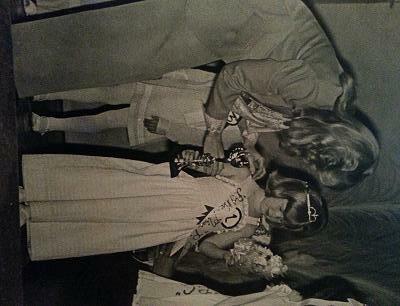 Notably, I came across a stack of photos from my Little Miss Phenix City days. They run the gamut from hilariously confused to hilariously stoic. It appears that I was not the smilingest of little pageant queens. Given that I had really not understood the whole process, I certainly didn’t understand why people were cheering for me. I knew why my family was happy, but I didn’t know any of those other people, and couldn’t figure out why they would care. Also, it took a really long time to get my hair to do that, and it was not done without tears. I did not think anything in the world could be worth all that time getting my hair done. 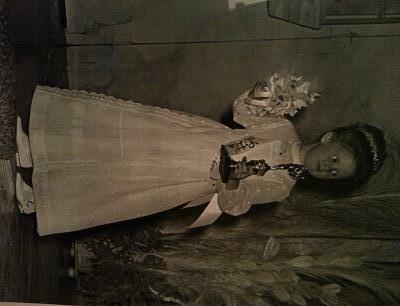 My family, especially my mother, had been very clear with me that winning the pageant wasn’t a big deal. If I won, that would be a fantastic honor, but if I didn’t, that was fine. I was still Lane, and no tiara could make me any better than I already was. I’ve written before that my school entered me in the pageant. I had no idea I was up for consideration until the school called my mother and told her to get me ready to compete. I think she had a week? So, we ran down to the Kiddie Shoppe in Columbus, GA and she bought me two dresses that were on the sale rack. My favorite was the one pictured above–it was a chick yellow, dotted Swiss, with a crisp white pinafore. I wore a floor length, white cotton sundress, with horizontal seams for the pageant. It had pockets. I loved the pockets. I love how confused I am. Like I’m wondering what in the world I am doing holding a bouquet. What I did not love was having to have my hair styled on a daily basis. I did not love having to stay clean. I did not love being kept out of the yard for a week. I was a play-in-the-dirt, rip my tights rolling on the ground, black-edged fingernails kind of girl. Nothing about me had changed, but suddenly I was getting attention from people who hadn’t bothered with me before, and even at 6 years old I recognized it had nothing to do with me, and everything to do with the tiara. My parents had done a good job making me believe the tiara didn’t make a bit of difference, so I was suspect of people who seemed to think it did. And there was that one rotten boy, who threatened to break into my house and steal it. When I started writing Destinee, I was trying to imagine what it would be like for a little girl whose world was founded on pageants. I was wondering what that little girl would grow up to be–that little girl whose mother had made her looks what mattered. That little girl whose family put value on her face, her hair, her fingernails, and not her heart, her mind, and her behavior. But I wanted Destinee to have a happy family. They might not share my values and they might not have expected much from their daughter, but they love each other, and they stick together. Tell you what, Destinee wouldn’t be looking like a deer in headlights on a runway. She’d look like she belonged there. While the nail salon had the deal running for a $13 gel polish manicure, I was doing really well! Then, the deal ended and they went up to $30. 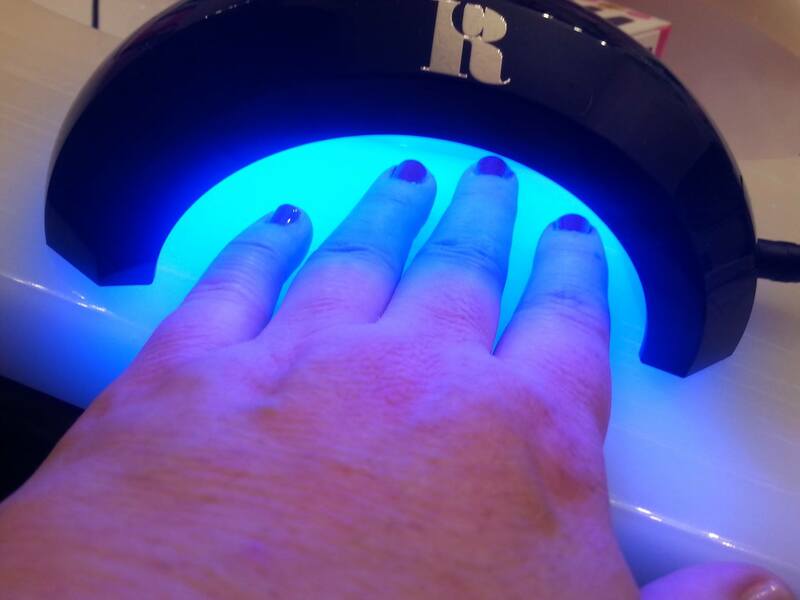 I tried another salon, and it was full of children running around, and there is no way I am going back to the happy nail salon where the manicurist cried while she did my pedicure–not my feet’s fault, I promise! 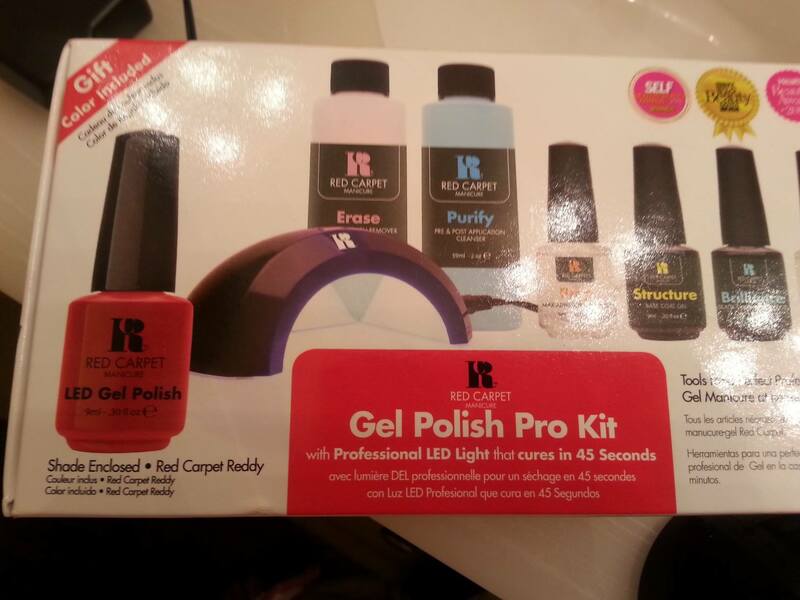 So, when I was in Ulta a few weeks back, I shelled out for the Red Carpet Gel Polish Pro kit. I figured it wouldn’t be too difficult to do my own gel polish. After all, the most important things are to be sure you only get the gel polish on your nail, and not on your finger, and to not look directly into the light. You start with clean nails, brush on some starter stuff (and try not to spill it all over the floor), then brush on the Structure and bake for 30 seconds, brush on two layers of color and bake for 45 seconds each, then brush on the Brilliance and bake for 45 more seconds. They call it “curing”. I call it “baking”. You rub on the Purify and you’re finished. If you’re halfway decent at painting your nails, you can be finished in 10 minutes. Paint, bake, paint bake, paint bake, paint bake and you’re finished! 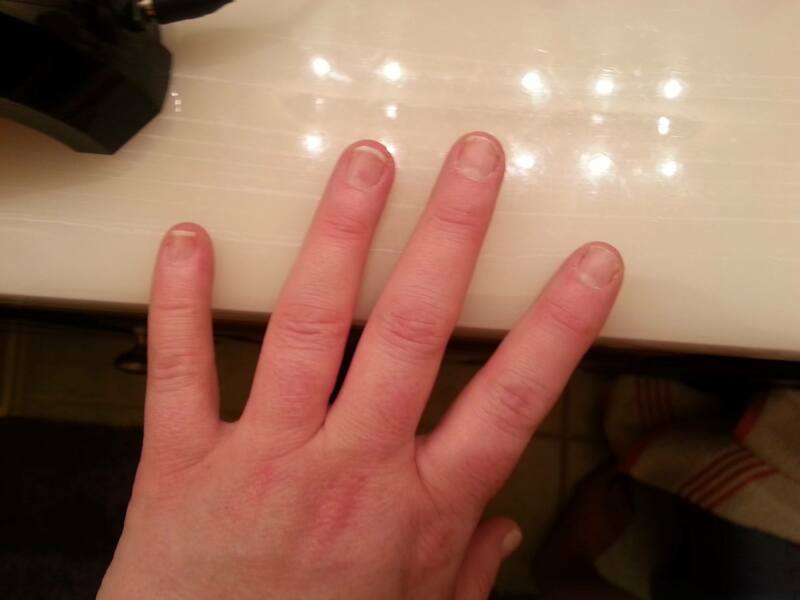 And a week later, you still have glossy, pretty fingernails! I got my kit for $15 less than it is listed on Ulta’s website here, but even if I had paid full price, I think it is worth it. The kit is very easy to use, the color wears well, and I like the idea of being able to take care of business myself if I chip a nail. It is very important to buy some orange sticks to go along with this. 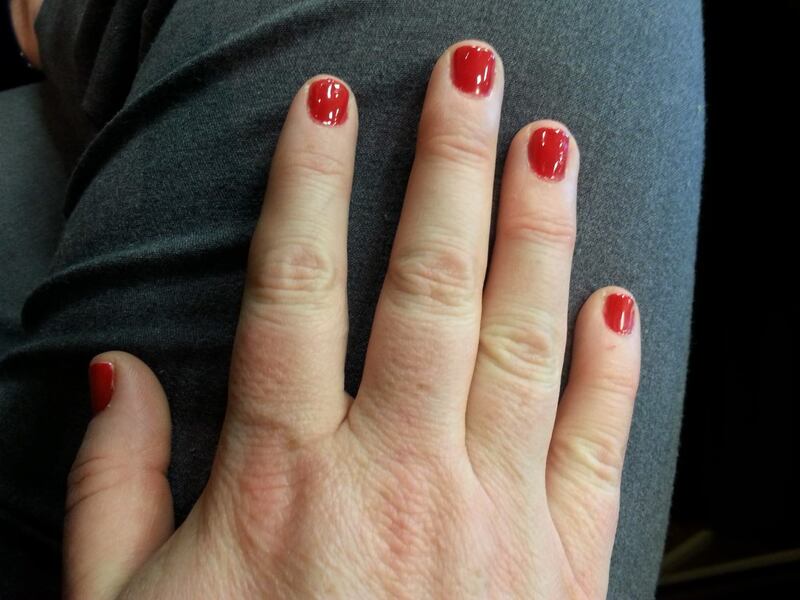 When you are painting your nails, use an orange stick to clean any color or base out from between the nail and your fingermeat before you bake. If you bake the gel to your fingermeat, then it won’t adhere properly to the nail, and it will peel right off. I watch NBC’s Fashion Star and I love it. Instead of making designers create couture out of garbage (which is less design, and more DIY crafting IMHO), designers create for actual buyers. Of course it’s scripted and just as fixed as any other TV reality show (AMBER SHOULD NOT HAVE GONE HOME), but the fact that you can buy what’s been bought every week, as soon as the episode ends a) is a clever way to capitalize on marketing, b) is a brilliant way to exploit the fear of not being able to get something that you just saw and you HAVE TO HAVE, and c) feels like The Jetsons, so it is amazing. I have wanted over half of everything I’ve seen on the show, and last season was distraught because Saks kept buying what I liked best and charging over $200 for every single item. Like I’m going to pay $200 for a shirt? Pfft. I’m still combing Ebay, hoping one of the dresses I wanted will pop up. I missed out on this shirt when it went up for sale at Macy’s, but lucked out finding it on Ebay. I am in love with it. It’s a half shirt, quarter sweater, quarter mesh sort of thing you’d find at Contempo Casuals circa 1992. In other words 100% perfect for me. It is soft, so soft, well made, well cut, and is also a limited item so I feel kind of special wearing it. I got mine in black. If I were going to wear shorts like that with my shirt, which I am not because of that recurring nightmare I have about being a Dallas Cowboy Cheerleader, I would want my legs to look as smooth and shiny as possible. To that end, I would use a product I just discovered. First, let’s talk about what I hate in a lotion/oil: Stickiness, slime-iness, greasiness, grittiness, and skin suffocation. You know what I mean? It’s hot here, and can be humid. If a lotion/oil coats your pores, you can feel like you are suffocating. It’s awful. Also awful is what a weirdo I am about getting my hands dirty. I hate putting lotion in my hands to rub somewhere else, but strangely don’t mind spraying on a lotion (thank you Sunblock Spray!) to rub in. Body Dew works for me on a lot of levels! I had a Pure Romance party, last weekend, presented by the lovely Sonia Torres Cortes, and I bought the Green Tea flavor of Body Dew. I love it! I am prone to dry skin on my legs–like, flaky skin dry in winter, and just dry in summer. I was skeptical of how well the Dew would work, but after a few days I can’t imagine living without it. My skin looks and feels fantastic. I think this is the best my shins and elbows have felt in years. It goes on as a light spray (squirt! ), and you rub it in. Seconds later, you can dress over it, and it doesn’t stick, pull, or soak through fabric. Nice! And, the green tea scent is fresh and clean, and underwhelming. I’d actually like the scent to be a little stronger. Go to Sonia’s website, and she can hook you up. She can also get you started with Coochy, which is a shaving conditioner. Something else I was skeptical about because I never believe miracle potions actually are. This was purported to allow you to shave even the bikiniest areas without causing bumps or rashes. So far, so good. It also comes in green tea. Since we’re talking about unsightly bumps, lets talk about cold sores. The first cold sore I can remember having came in Kindergarten. It was massive, the size of a quarter, and covered half my lower lip, and part of the area between my lip and chin–it was so bad, it left a scar. My mom treated it with Campho-Phenique, which was the best we could do at the time. The monster returned in First Grade, with such a horrifying vengence, they wouldn’t even photograph me head-on for my class picture. They made me pose in profile. I end up with a cold sore in left-middle of my bottom lip a few times a year. Now, instead of using the campho, I use Abreva at the first tingle of a blister. It usually takes about 3 days to clear up completely, but the sore never gets much bigger than a pin head, never goes into the gross scab phase, and doesn’t hurt. Abreva is one of the things you can always find in my purse, along with Tei-Fu oil, which is my family’s version of Big Fat Greek Wedding Windex. In fact, I keep a little bottle of that on my desk, too. That’s it for now! So, start watching Fashion Star (or watching it on DVR, like I do–Express, Macy’s and Saks update their sites on Friday evenings, so you can shop even if you don’t watch the episode), get yourself some Body Dew, and tell the world about Abreva and Tei-Fu. I hope you don’t get cold sores, but if you do, I’m telling you that stuff works.